Power quality problems are among the main causes for business downtime, equipment malfunction and damage. The different types of power quality disturbances, their impact on equipment and electric installation, as well as possible mitigation solutions are well known today. However, there are no standards, recommendations or guidelines on how to implement, manage and continuously improve the power quality in an electrical network. Worldwide customer surveys show that complaints on power quality related disturbances (harmonics, voltage dips, flicker, and etc.) are increasing every year. Customer loads are changing, including more and more electronic equipment and switching devices. Simultaneously, the same equipment is far more sensitive to power quality problems and will fail more often due to power quality events. Due to the increasing awareness of the impacts of variations in the quality of electrical supply customers expect a better quality of electrical service. There are different types of solutions to manage the power quality problems that exist. However, there is no internationally recognised power quality management methodology. 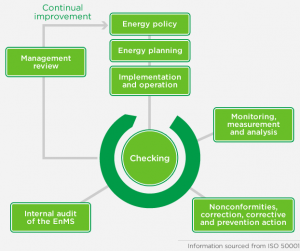 This generates a barrier for facilities who want to improve their power quality, as they do not know how to address critical aspects of their power quality performance – including measurement, monitoring, documentation, reporting, analysis, preventive and corrective actions. To perform Power Quality Measurements, a system should be equipped with power quality metering devices. They should be able to capture and record short term power quality events, provide current and voltage, continuous disturbance measurements and power quality compliance evaluations. A key for continuous improvement of power quality and power system health is to gather and connect the information of all available sources into one system and provide tools to evaluate, analyze, report and alarm on power quality issues. Based on interpretation results and conclusions, different solutions can be considered. They may include equipment for the mitigation of Power Quality Disturbances, Settings Modification, Design and Architecture modification or even selection of Equipment less-sensitive to Power Quality Disturbances.